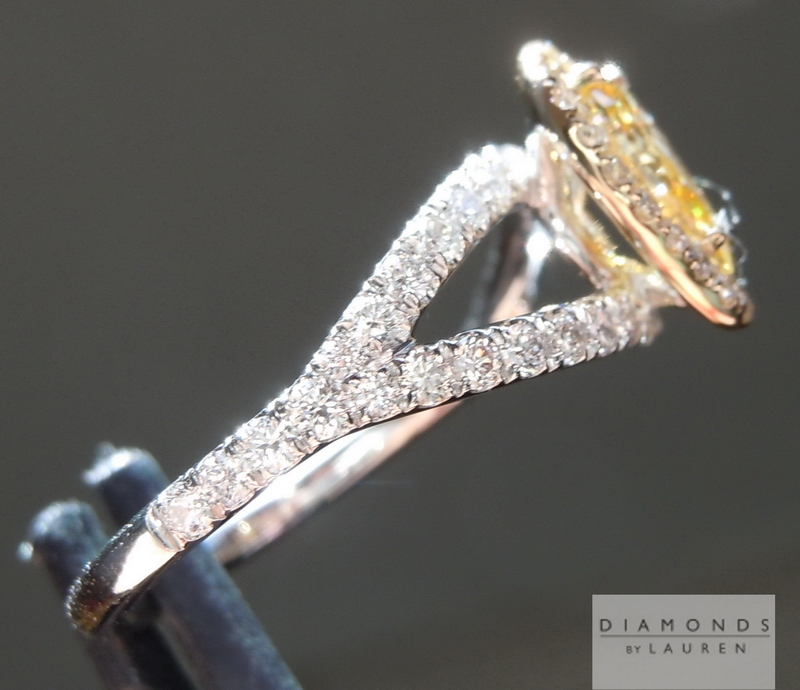 The split shank on this ring is prominent and is very complimentary to the shape of the center diamond. 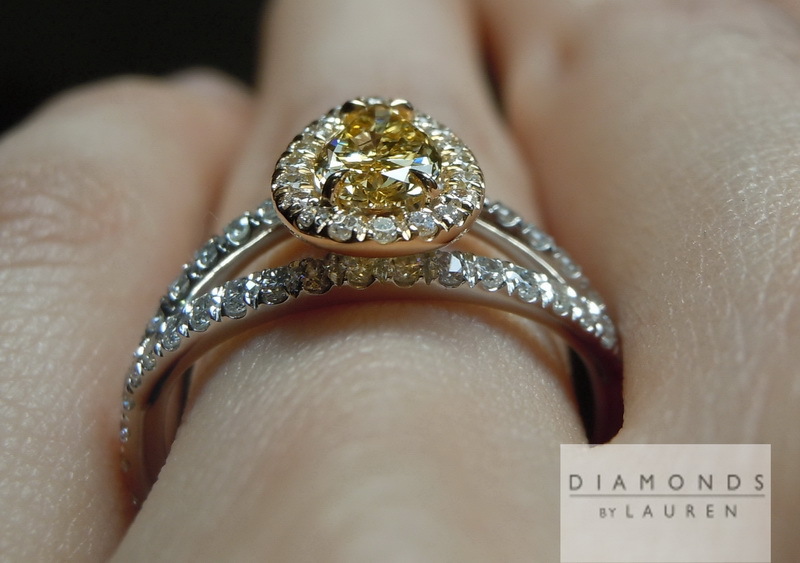 The ring has soft edges to it making it very comfortable to wear. 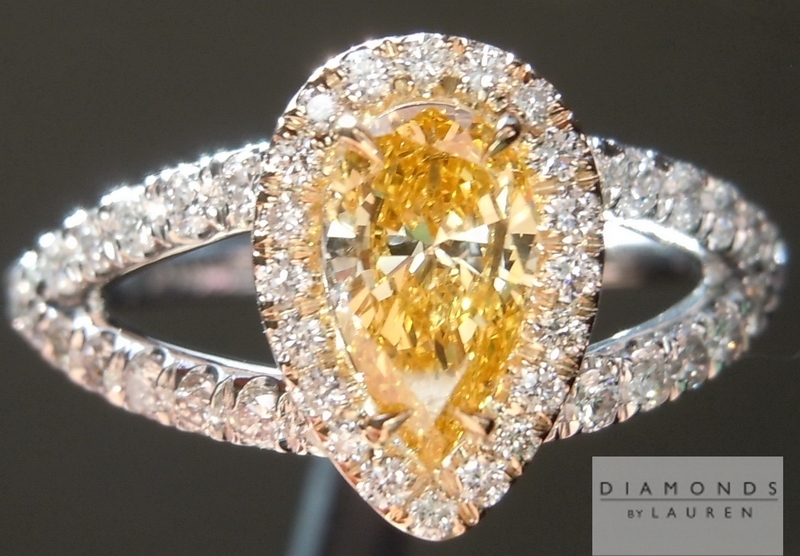 The halo was done in yellow gold with colorless diamonds adding a subtle contrast in color to the shank. 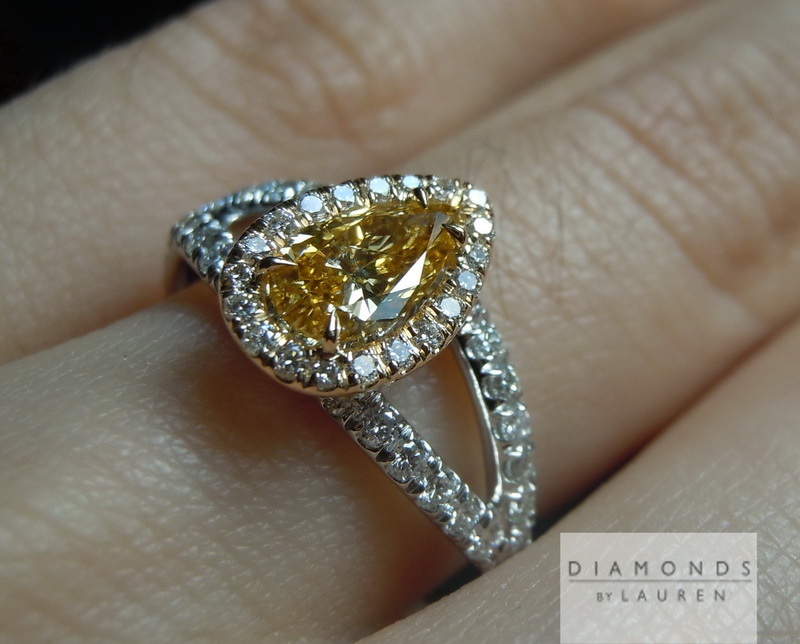 The orange diamond really comes to life in this ring. 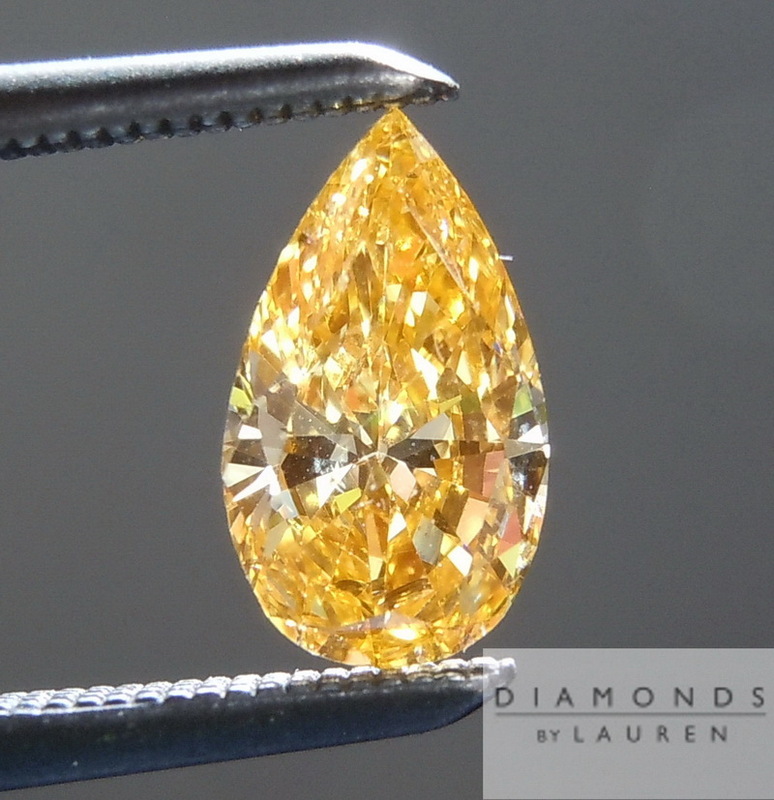 A lot of people are looking for orange diamonds. 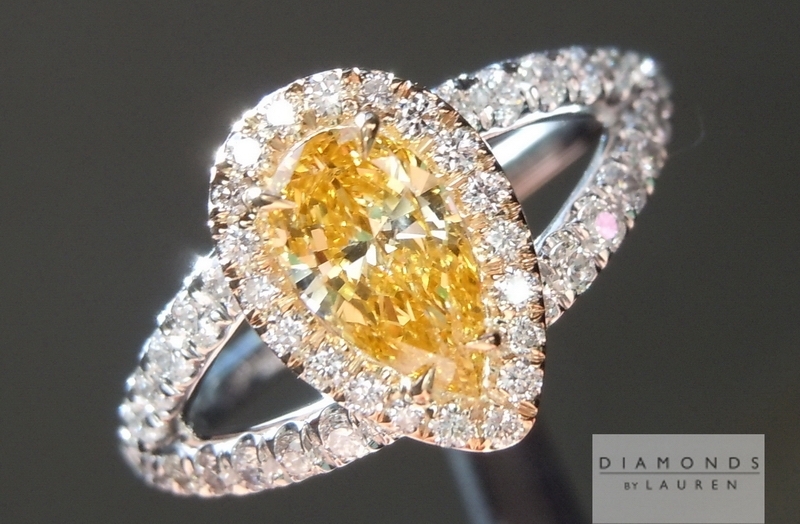 Pure orange just one of there is colors of all and diamonds. 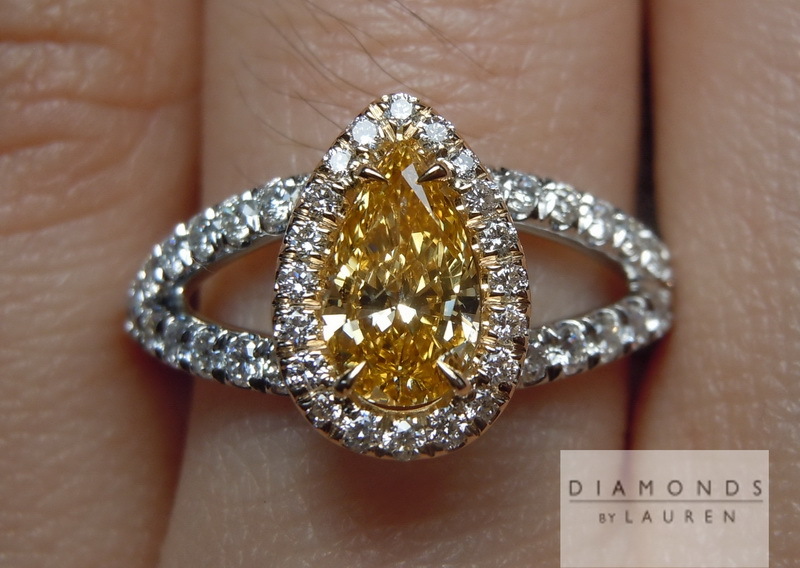 This one is a vivid orange yellow. 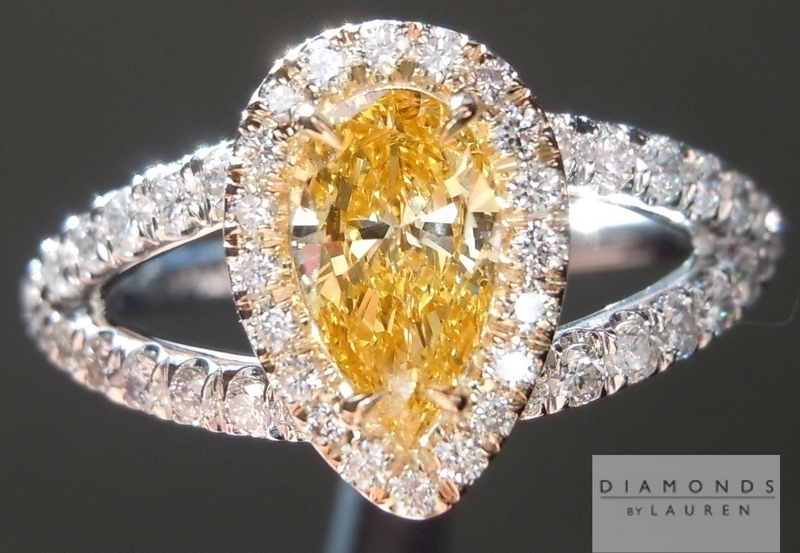 It is a gorgeous shade and there is a lot of orange to be seen. 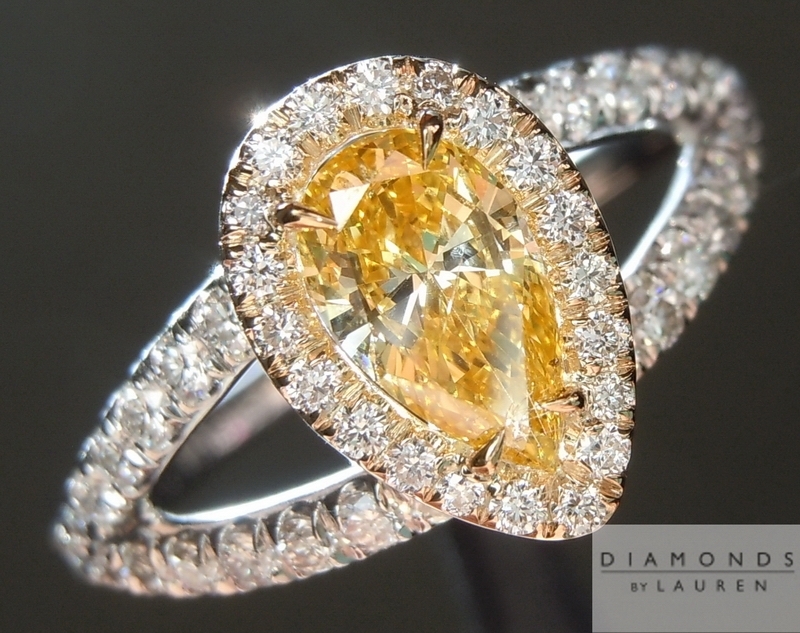 It is a gorgeous pear shape. It also has a good size for its weight. The sparkle is amazing throughout, with no apparent bowtie. The GIA report notes a number of characteristics that might be of concern in some cases, and might not be of concern in other cases. 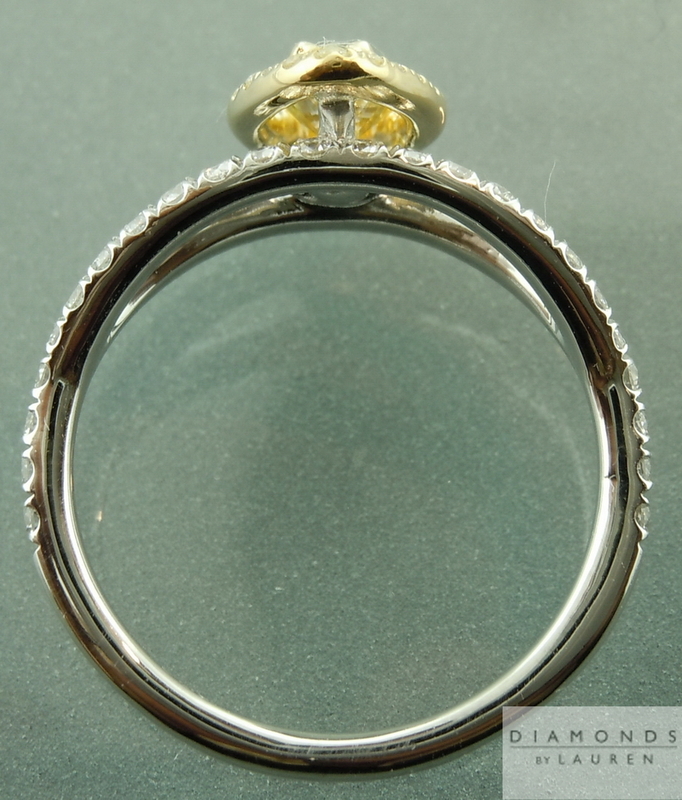 For one thing, the diamond has an I1 clarity. There is a feather which can be in some of the photos – and then again in other photos you just cannot make it out. 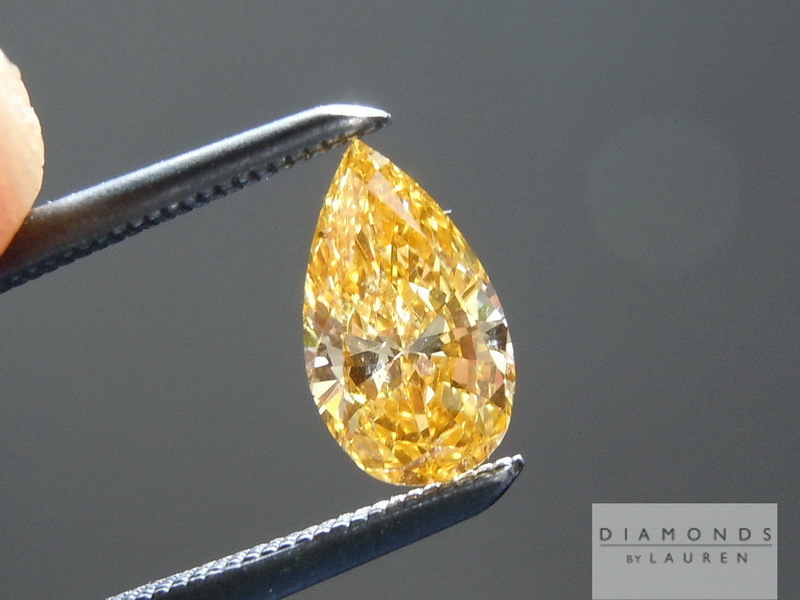 This is a case where it is a totally eye clean I1 diamond – and the imperfection has no perceivable impact on the overall brilliance of the diamond. 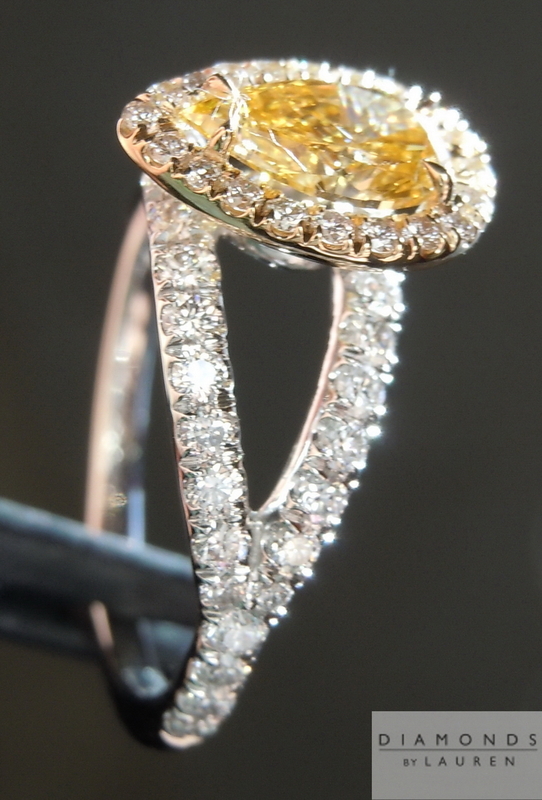 I should add that it is possible to see the imperfection when you view the diamond from the bottom – now that it is loose. Generally this is not an issue – although for some people it is, so we mention it. Now set you will not even be able to see you then. 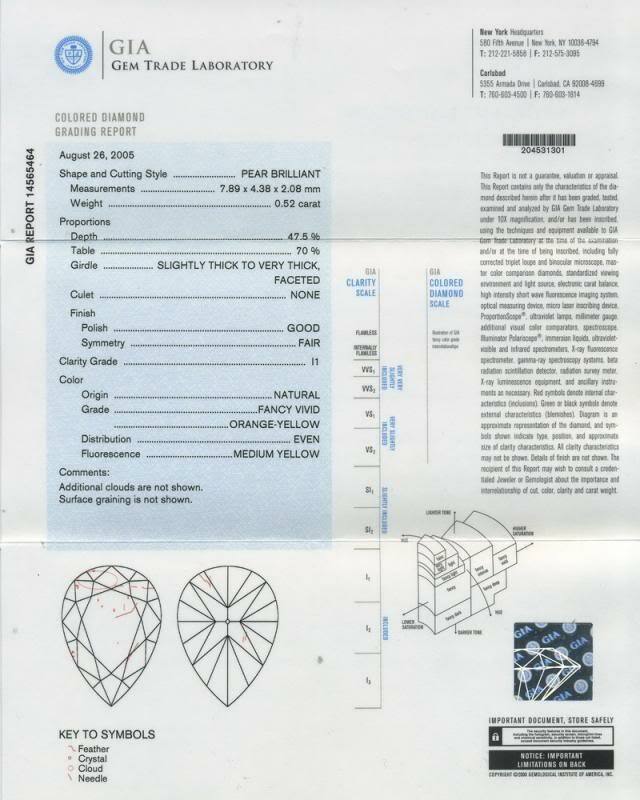 They also called the symmetry "fair" due to some minor differences between the crown facets on one side of the diamond as compared to the other side of the diamond. This has virtually no visual impact as well. 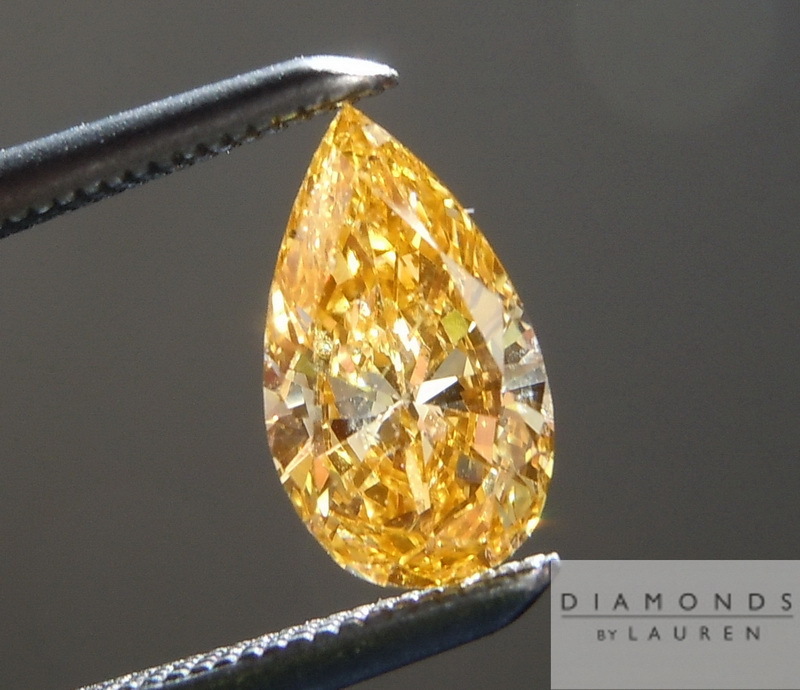 Overall, it's a gorgeous diamond that shows a lot of orange at a relatively reasonable price.